This gorgeous portrait of British born Edwardian actress Gabrielle Ray was published by Aristophot Co., Ltd (1905-1910) a postcard company based at 11 Southampton Row, London, England, although the card was printed in Leipzig, Saxony. 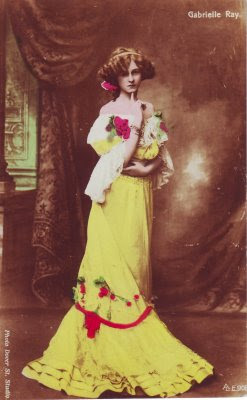 It is an uncirculated hand-coloured postcard print taken from a photograph by The Dover Street Studios, one of the leading firms specialising in theatrical portraiture based at 38 Dover Street, London. Born Gabrielle Elizabeth Clifford Cook on the 28th April 1883, Gabrielle Ray had a successful stage career in the United Kingdom appearing in numerous musical comedies until she suffered a nervous breakdown in 1936 and was then institutionalized for nearly forty years. She died at the age of ninety on 21 May 1973. There's a wonderful collection of Miss Gabrielle Ray postcards here.